Dew-kissed currants, warm from the sun, look like candy, but surprise the tongue. Their flavor is bright and tart, almost like cranberries but sweeter. Poor little currants. They don’t enjoy nearly the same popularity here in the US as they do in England and other parts of the world. Related to the gooseberry, currants can be either red, white or black. Black currants are sweetest, then white, and then red, which tend to be tart. Usually featured in sweet dishes, both red and black currant also lend themselves well to savory dishes, as their sweet-tart flavor provides a pleasant contrast. To easily remove currants from their stems, use a fork’s tines to gently tug the berries, just a few at a time, downward and into a waiting bowl. Preheat the oven to 375°F. Grease an 8×8 or an 11×7 inch cake pan and set aside. In a large bowl, gently stir together 1/2 cup of the sugar, the currants, and the cornstarch, until currants are coated with the sugar mixture. In a separate large bowl, whisk together the remaining 2/3 cup of sugar, the flour, the baking powder, and the salt until evenly combined. Add the chilled butter cubes and the egg, and use a pastry cutter or a fork to blend the butter and egg into the flour. When finished, dough will be crumbly with pea-sized chunks of butter. Press 2/3 of the dough into the prepared pan. Top with the currants. Clump the remaining dough together into a loose ball, then crumble it over the top of the currant mixture. 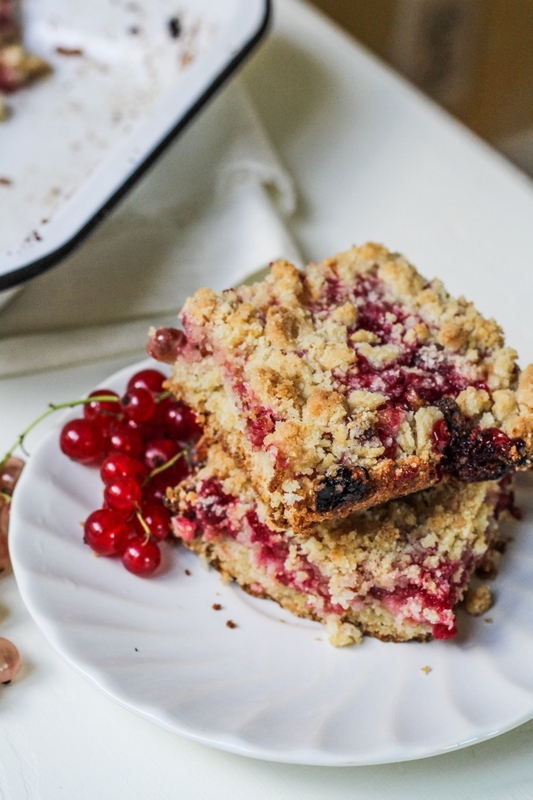 Bake for 35-45 minutes, until currants are bubbly and top of crust is golden brown. Adapted from Smitten Kitchen. Makes 16 bars. Wash and dry the lettuce/ greens and tear by hand into small, bite-size pieces. Slice the cucumber very thin. Toss the lettuce, cucumber, and cashews. Whisk the oil and vinegar together to taste and toss with the salad. Season to taste with salt and pepper, and divide among four salad plates. Sprinkle the currants evenly over the four plates and serve immediately. Notes: Don’t put too many extra currants in the batter or else the muffins will fall apart, they need enough batter to hold together – the 1 1/4 cups is fine. The recipe works well in half also, it will make 6 very large muffins or 8 medium sized. 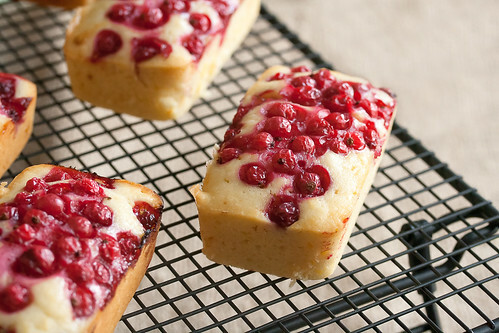 A scattering of fresh red currants adds a pop of bright color and tartness to classic French yogurt cake. Preheat oven to 350F. Lightly grease and flour the cups of a mini-loaf pan (or a jumbo muffin tin, if you prefer). In a large bowl, whisk together yogurt, sugar, eggs and canola oil until smooth and well blended. Add flour, baking powder, salt and lemon zest, and stir until the batter is smooth and silky. Pour into the prepared mini-loaf tin, dividing evenly between the cups. Scatter berries on top of the batter, using around 2 tbsp per loaf. Bake in preheated oven for 25-30 minutes, or until the edges are pale gold and a toothpick comes out clean when inserted into the center of one loaf. (If using a muffin tin, you may need to add another 5 minutes of cooking time.) Let cool on a rack for 20 minutes in the pan, then turn out and let cool completely before serving. Make the crust: Heat the oven to 350 degrees F. Melt 5 tablespoons of butter and toss with the crushed cookies and 1 tablespoon honey. Press into a 9- by 9- inch square tart pan. Bake until firm — 12 to 15 minutes — and cool completely. Make the filling: Fill a large bowl halfway with ice water and place a slightly smaller bowl on top. Set aside. Heat the milk, vanilla bean and seeds, and the orange zest in a large saucepan just to a boil. Remove from the heat and let steep for 20 minutes. Whisk the egg yolks, 1/4 cup honey, and sugar together in a large bowl until thick and pale yellow. Sift the flour and cornstarch over the egg mixture and whisk until smooth. Reheat the milk just to a boil, and whisk a few tablespoons at a time into the egg mixture. Transfer back to the saucepan and cook, whisking constantly, over medium heat until the mixture begins to bubble and thickens — about 3 more minutes. Strain into the clean bowl of the ice bath. Dot with remaining 1 tablespoon of butter. Cover with plastic wrap directly onto the surface. Cool completely. Assemble the tart: Fold the whipped cream into the filling. Spread filling into the cookie shell and top with the currants and berries. Heat the jelly and 1 tablespoon water. Dab over the fruit. Chill for about 30 minutes. Strain the juice into a bowl pressing on the pulp to make sure you’ve gotten all the juice. Stir half the currant juice (for a more tart curd, add about 3/4 of it), yolks and sugar together in the rinsed sauce pot and place over medium heat. Stir constantly until the mixture has thickened enough to coat the back of a wooden spoon. Remove from heat and add butter, 1 piece at a time, until incorporated. Scrap curd into a bowl and push a piece of plastic wrap right against the top of the curd (to prevent a skin forming). Refrigerate for at least an hour so it can set.